Star Trek Beyond: Box Office Failure Or Success? Kicking off in 2009, the Star Trek Kelvin Timeline brought the classic sci-fi property to new commercial heights, introducing the franchise to a much wider audience than it had seen before. Though some fans criticized the action-heavy approach from director J.J. Abrams, his first film was critically acclaimed (earning a Best Picture nod from the Producers Guild) and made a strong $257.7 million domestically (a series best). The sequel, 2013's Star Trek Into Darkness, was more divisive, but still earned positive reviews, and grossed $228.7 million at the box office. This summer, Paramount celebrated the 50th anniversary of Star Trek with the new film Star Trek Beyond. In a season full of disappointments, the movie was a refreshing breath of fresh air, as many (including us) felt it was a fun, entertaining ride that paid respect to the franchise legacy. Beyond is one of the few tentpoles in the last few months to earn an enthusiastic response, but that unfortunately has not translated into a home run, box office wise. As the movie enters its fourth weekend in theaters, it's worth wondering whether or not Star Trek Beyond can be considered a commercial success. Compared to its predecessors, Beyond is considerably behind. For its opening weekend, it brought in $59.2 million in the States, which was good enough for first place, but not exactly a great haul. 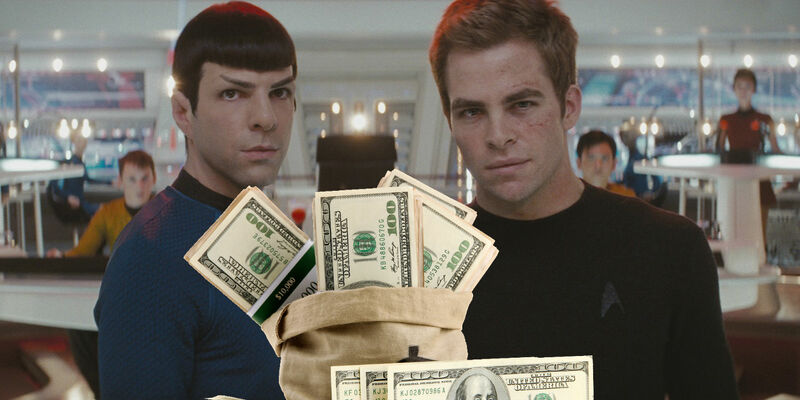 In contrast, Star Trek brought in $75.2 million during its first three days, while Into Darkness made $70.1 million. Despite the strong reception from audiences and critics, the demand for Beyond wasn't entirely there. The main culprit for that, be it a lackluster marketing campaign, the time of release (during Comic-Con weekend amidst Marvel and DC news), or something else is a debate for another day. From the beginning, it became clear that Beyond would not be able to top the earlier films, and it's had an uphill struggle to make its budget back. As of this writing, director Justin Lin's movie has grossed just $196.9 million worldwide against a $185 million price tag. Unlike Star Trek or Into Darkness, Beyond did not have strong legs. Whereas those first two installments fell 42.8 percent and 46.9 percent in their second weekend, respectively, Beyond dropped a whopping 58.2 percent as it dealt with the arrival of Jason Bourne. Once the hyped-up Suicide Squad made its way into theaters on August 5, Star Trek Beyond was pretty much done doing major damage at the box office, taking a 59.5 percent hit in its third weekend. So, while Star Trek Beyond has recouped its production costs, it's hard at this juncture to call it a true blue success. Ghostbusters has made $180 million globally (more than its $144 million budget), and Sony is reportedly scrapping the planned sequel due to losses of $70+ million. The general rule of thumb is that a film has to gross twice its budget to "break even," which means Beyond's magic number stands at $370 million. As it currently stands, it still needs to bring in another $173.1 million to reach that mark, and business for the film is starting to wind down. Domestically, it may not get to $200 million for its run. This is somewhat troubling for Paramount, since prior to the release of Beyond they announced that Star Trek 4 was happening with Chris Hemsworth coming back to play George Kirk. Some viewers may be wondering if a fourth entry in the Kelvin Timeline is worth the investment, since general audiences don't appear as infatuated with Star Trek as they used to. Between Into Darkness and Beyond, Marvel's Guardians of the Galaxy became an overnight phenomenon and Star Wars made a triumphant return to the big screen, seemingly filling the need for space-based adventures. However, Star Trek Beyond isn't done yet, and like many blockbusters before it, its saving grace is going to be the international box office. The modern Trek films have made the brand more viable, and that is readily apparent in the worldwide figures. In 2009, Star Trek grossed $385.6 million globally, and Into Darkness improved upon that with $467.3 million. As stated above, Beyond has yet to reach $200 million worldwide, but that is in part because it hasn't opened everywhere just yet. There are currently 21 countries waiting to see the film, including the very important China, which has become the second-largest film market in the world. Beyond will open in the territory on September 2, following several other premieres to close out August. It's worth pointing out that Paramount has teamed up with two Chinese media corporations for Beyond. The studio struck a deal with Alibaba Pictures to receive an undisclosed investment. Additionally, Huahua Media is on board. These partnerships are sure to be beneficial for Paramount, since it most likely means awareness for Beyond in China will not be an issue. They worked with Alibaba on last summer's Mission: Impossible - Rogue Nation, which grossed $682.3 million worldwide, with $135.6 million coming from Chinese theaters. That was by far the second-largest total, trailing on the $195 million from the United States. This bodes well for Star Trek Beyond, since it should perform similarly when it reaches China. Several would-be box office bombs have turned into moderate successes because of the overseas box office. Terminator: Genisys made $440 million worldwide, and Warcraft took in $433 million after grossing just $89 million and $47 million respectively domestically. Pacific Rim is getting a sequel in large part due to its $411 million global intake. Given that Beyond has surpassed all three of those films in the States, it ideally will have no trouble ending up in the same ballpark worldwide. Its profit margin may not be as substantial as its contemporaries, but it should still end up in the black when it's all said and done. It will be interesting to see how Beyond's box office impacts the series moving forward. Chances are, Star Trek 4 will have a lower budget than Beyond's $185 million, making the potential for sizable return on investment greater. Paramount obviously won't give the filmmakers peanuts to work with, but they will most likely try to manage the costs in whatever way they can. It wouldn't be surprising for the fourth Kelvin Timeline adventure's costs to be in the $150 million range, the same as the aforementioned Star Trek and Rogue Nation. The "break even" point in that instance is $300 million, which any well-received tentpole should clear relatively easily. While Star Trek Beyond probably won't make as much (particularly domestically) as the first two movies, it is not a disaster in any meaning of the word. It will get a nice boost at the very end of the summer from its international rollout, which will push the film into the realm of profitability. It's another illustration of how Hollywood has become a global industry and highlights why studios have a keen interest in making sure their major projects appeal to a wide audience. When the ball gets rolling on Star Trek 4, Paramount will probably look to work with Alibaba and Huahua again. Along with Transformers, Star Trek is one of Paramount's most prized possessions, so this news will come as a relief to them. They have no reason to cancel another sequel and just have to strategically find the right release date so it can open to higher numbers and have a more fruitful run. It will also be pertinent for them to deliver a terrific marketing campaign, as the initial teasers for Beyond rubbed many the wrong way. regardless, Paramount can take solace in the fact that they still have a go-to franchise and they just have to work on making the next one "better," from a commercial perspective.